Penang is an island to the north of Peninsula Malaysia. It is an idyllic resort but also a bustling city. It’s cuisine is predominantly influenced by the cooking styles of the migrant southern Chinese. Two styles are dominant – ‘Hokkien’ for the dialect spoken by the majority of Chinese and ‘Nyonya’ for the Chinese who fully assimilated into native Malay culture. The best food is sold in road-side stalls and known traditionally as ‘hawker food’. 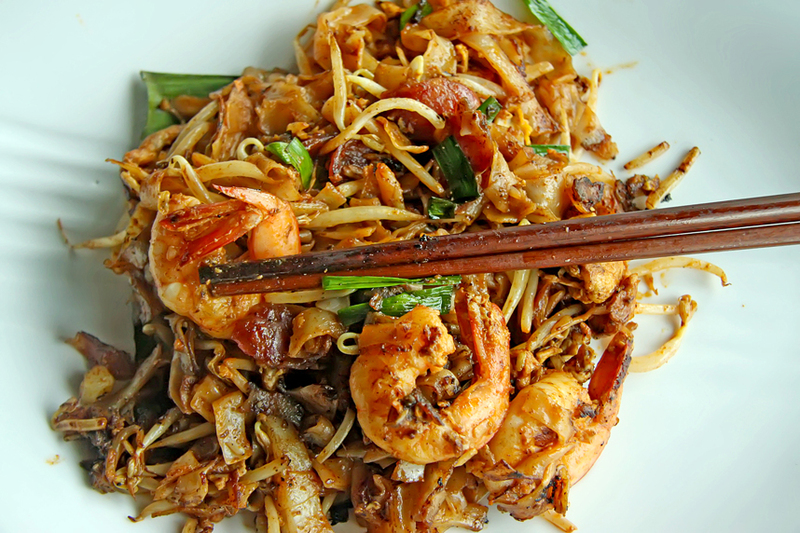 Penang can lay claim to several unique dishes including ‘char koay teow’, a noodle dish fried in deep rich soy sauce and oil together with bean sprouts, prawns, cockles, chilli and other spices. Chinese noodles can be divided into two broad categories, dried and fresh. Each is made with a variety of ingredients in the dough, wheat flour, rice, plain flour, egg, beans etc. The dough can be factory made or rolled, kneaded, flattened and cut by hand. Some common noodles are wheat noodles; fresh and dried egg noodles; rice flour noodle; dried Chinese rice vermicelli, in various thickness; dried green mung beans or cellophane noodles. Our recipe requires fresh flat rice noodles. This noodle can be purchased from a Southeast Asian grocery store and is generally kept in the fridge unless it has been freshly delivered that day. Ask the proprietor of the shop if you’re not sure. Heat the oil in a wok over high heat and stir fry the garlic until golden brown, about 2 minutes. Add 1-2 tablespoons of the chilli paste as desired and stir fry for another minute. Add the prawns, Lap Cheong (if using) and stir fry for 3 minutes, or until cooked. Add the noodles and stir fry over high heat for 2 minutes, then push noodles aside, add a touch of oil and one egg at a time. Cover the eggs with the noodles, then repeat the process until all the eggs are used. Add the soya sauces, chives, bean sprouts, and season with salt. Stir fry until all the ingredients are thoroughly heated. Serve immediately.